Chris Cochrane, a guitarist, singer, songwriter, improviser and producer, has been active in the New York music scene since 1983. 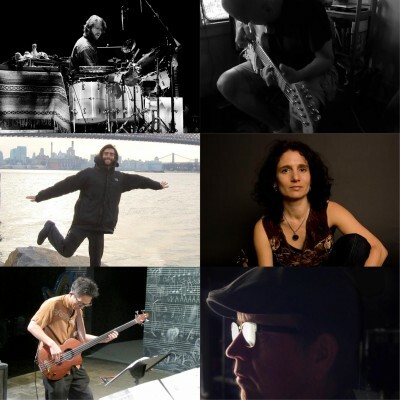 He has worked with a vast array of great artists, including John Zorn, Zeena Parkins, Andrea Centazzo, T Bone Burnett, Marc Ribot, Fred Frith, Thurston Moore, Richard Buckner, Kramer, Eszter Balint, Derek Bailey, Annie Gosfield, Ikue Mori, Tom Cora, and Bob Ostertag. He has composed music for dance and theater productions by Ishmael Houston-Jones and Dennis Cooper, John Jasperse, Nayland Blake, Circus Amok, and others. Billy Martin of Medeski Martin and Wood. Martin has relentlessly pursued new musical contexts, from purely free improvisation to chamber compositions to film music – including his recent score to director Szabolcs Hajdu’s Mirage. Much of his output is available via his own Amulet Records label, which has also released albums by Derek Bailey, Dave Burrell, John Lurie, and, most recently, the vinyl edition of The Road to Jajouka – a series of collaborations (produced by Martin) between the Master Musicians of Jajouka and such artists as Ornette Coleman, Flea, Marc Ribot, John Zorn, Lee Ranaldo, Bill Laswell, Mickey Hart, Medeski Martin and Wood, and more. Martin is also an accomplished filmmaker and visual artist, whose work has been exhibited in solo and group installations around the world – including 2014’s Cartegena de Indias Bienal in Colombia. Kato Hideki (Kato: family name; Hideki: given) is a musician, composer & producer. His music is often based on narrative elements and topical issues, with a wide range of forms and sounds. His own projects are: Death Ambient with Ikue Mori & Fred Frith; Green Zone with Otomo Yoshihide & Uemura Masahiro; Tremolo of Joy with Charles Burnham, Briggan Krauss, Ed Tomney & Calvin Weston; OMNI with Nakamura Toshimaru & Akiyama Tetsuji; Plastic Spoon with Karen Mantler, Douglas Wieselman & Shahzad Ismaily; and the solo works Hope & Despair and Turbulent Zone. As a bassist, he has worked with Eyvind Kang, Karen Mantler, Zeena Parkins, Jim Pugliese, Marc Ribot and John Zorn among many others. Collaborators include Nicolas Collins, James Fei, John King, Christian Marclay, Ursula Scherrer and Michael Schumacher. He co-produced music for THEM with Chris Cochrane and Karen Mantler’s Business is Bad for XtraWATT/ECM Records. He teaches at NYU POLY Integrated Digital Media. Kevin Bud Jones played his first NYC gigs in 1981 as guitarist in the DIY dance band Dog Eat Dog. Sharing bills with Sonic Youth, Swans, Three Teens Kill Four and other notables of the time, DED was requested by DNA to open their farewell show at CBGB’s in 1982. Post Dog Eat Dog Kevin performed at the White Columns Speed Trials in the short lived band Big Day while working in his home studio with various artists producing music for film and performance. The last four years Kevin Bud Jones has been working with the trio Airport Seven while continuing to release home recordings of his own compositions The past year finds Kevin working with Chris Cochrane in duet as well as with the band Collapsible Shoulder. As the result of an injury in February Kevin had to put down his guitar and has taken up analog synthesis, samples and electronics as his current instrument. Jessica Lurie Known for “melding lyrical pop, stinging rock, rhythmic Eastern European folk music and improvisation-heavy jazz with a dose of free-wheeling avant-groove-meets-grind” (Dan Oulette), Jessica Lurie is an award-winning composer and multi-instrumentalist, performing on saxophones, flute, voice, accordion and electronics. Current and long-established projects include her Megaphone Heart Band, the Tiptons Saxophone Quartet & Drums, Living Daylights Trio, Sephardic music group Sophie Salonika, Jon Madof’s Zion80 afrobeat big band, and improvising collective Slingshot Songs, performing in clubs, concert halls, squats, universities and festivals all over Europe and North America. As an in-demand side person and collaborator, Jessica has performed and/or recorded with Fred Frith, Zion80, David Krakauer, Bill Frisell, Skerik, Todd Sickafoose, Allison Miller, the Indigo Girls, Mark Ribot, Karl Denson, Frank London, Todd Sickafoose, Allison Miller, Jenny Schienman, Vinicio Caposella, Nels Cline, Thollem McDonas, Sleater Kinney, The Slip, Jacob Fred Jazz Odessy, Kenny Wolleson, Bill Horist, Bernie Worrell and Ivan Neville among others. Jessica is featured on over 60 recordings, and is currently working on new material for a 2015 release with the Megaphone Heart Band. Brian Chase is a drummer and composer living in Brooklyn. His diverse range of work/play includes that with rock band Yeah Yeah Yeahs, the community of the New York improvised music scene, and Drums & Drones, an electro-acoustic project focusing on the application of just intonation to drums and percussion; the debut Drums & Drones album was released in February of 2013 on the Pogus label and features videos by artists Ursula Scherrer and Erik Zajaceskowski. Album releases of 2014 include Dub Narcotic Session with pianist Thollem McDonas and we thought we could do anything with guitarist Alan Licht. In addition to the drums, Brian is a regular practitioner of Ashtanga yoga.